The physical and mental health behaviour of today’s adolescent generation are determinants of growth and development, now and throughout their lifespan  . The technological advances of modern society have contributed to sedentary lifestyles, causing young people to have an increased body weight and body mass index (BMI) than one generation earlier. The gradual increase of habitual sedentary behaviour and physical inactivity seen in adolescents is a major contributor to chronic health conditions and is strongly correlated with the diagnosis of these diseases . This trend is at risk for continuing with the present day's young generation, as research suggests that the levels of physical activity decreases between the ages of 11-15 . Globally, physical inactivity is the fourth leading risk factor for mortality, causing 3.2- 5 million deaths annually   . While many of these chronic diseases are identified in adulthood, research suggests that the development of these conditions originate in childhood and adolescence  . Furthermore, young people may have a less impressionable attitude towards their body image than adults, which may provide less resistance to behavioural change interventions  . Therefore, the learning of healthy behavioural habits must be accomplished during adolescent years, which will assist in carrying forward this healthy active behaviour into adulthood. Behaviours of active living established in early years can provide the greatest impact on maintaining these positive habits across one’s lifespan and influence mortality and longevity  . What is the aim of this Wiki? Physiotherapists have the knowledge and skills to design, plan and implement interventions aimed at increasing levels of physical activity in young people. Although research in the area of increasing physical activity is well established, interventions aimed at maintaining an active lifestyle is an emerging area. Physiotherapists can therefore utilise this resource to facilitate and guide active living behaviours in young people so that this behaviour is maintained into adulthood. This Wiki resource incorporates a behavioural change framework that can be utilised for the larger young population, delivered in different community settings. a particular emphasis will be placed on the Transtheoretical Model (TTM)  of behaviour change, which categorises individuals into various stages, depending on their physical activity levels. A modified questionnaire has been developed within this resource to assist practitioners in identifying which stage of the TTM the young population is in. This categorisation is based upon the amounts of vigorous, moderate or walking activities performed within the last week. The physiotherapists can use this knowledge to identify and build upon the individuals’ or groups’ strengths to encourage them to maintain active living behaviour into adulthood. By focusing on individual factors and activities that individuals enjoy, the aim is to encourage adolescents to stay in the maintenance phase of the TTM of behaviour change, rather than regressing to other stages, thus maintaining an active, healthy lifestyle . This resource aims to increase active living and maintain an active, healthy lifestyle in the adolescent population. 2 What is the aim of this Wiki? 5 What is Active Living? Physical activity (PA) is defined as any movement carried out by a skeletal muscle that requires energy and ranges from low, moderate to vigorous PA with varying amounts of energy expenditure. While sedentary behaviour is defined as an individual who engages in prolonged sitting or lying positions without much movement . Common sedentary behaviours includes TV viewing, video game playing, computer use (collectively termed “screen time”), driving automobiles and reading . Research suggests that on average 39% of adults in the UK are not physically active . Physical inactivity causes 3.2-5 million global deaths annually and is the 4th leading risk factor for global mortality . Nearly half of the young population in the UK are sedentary apart from school activities . Common sedentary activities include: screen-based sedentary behaviour, social sedentary behaviour, TV-viewing, homework and academics and lastly motorized transport . It is estimated that 13% of the young people aged between 11-15 yrs in England are not meeting the physical activity recommendations . If this strategy is actually carried out it has the opportunity to impact many people, with physiotherapy outpatient contacts alone numbering 3 million across the UK . This serves patients that attend clinics well as an active lifestyle is promoted to them. The issue is that this only targets the population that attend the clinic which is reactive rather than a pro-active/preventative. A large proportion of the population who lead sedentary lifestyles but have no current health issues or have not attended a health professional’s appointment are missed. There is also little known on the extent to which physiotherapists embedphysical activity promotion in their routine care and sparse evidence that it is comprehensively promoted in healthcare settings . In order to increase physical activity worldwide it has been identified that a systems approach is required that focuses on populations and the complex interactions among the correlates of physical inactivity, rather than solely a behavioural science approach focusing on individuals . Healthcare is part of this system and within healthcare there is a need for organisational, environmental and individual approaches promoting active living. Several government, national health service and organisation strategies and policies have been developed which highlight the importance of community-based health care and the need to proactively seek to change the future of the nations health. In 2015 an agreement was signed by all allied health professionals to their professions to the forefront of public health workforce  and ensure that they are working to improve the four domains of public health (Health Promotion, Wider Determinants, Public Health Care and Health Improvements). Some of the key contributions were: community development programmes, supported self-management, prevention, health improvement campaigns and promoting healthy environments. Recently the Chartered Society of Physiotherapists has released in corporate strategy for 2017-2020 which states that physiotherapists should "empower individuals and communities to maximise independence and live long and live well". 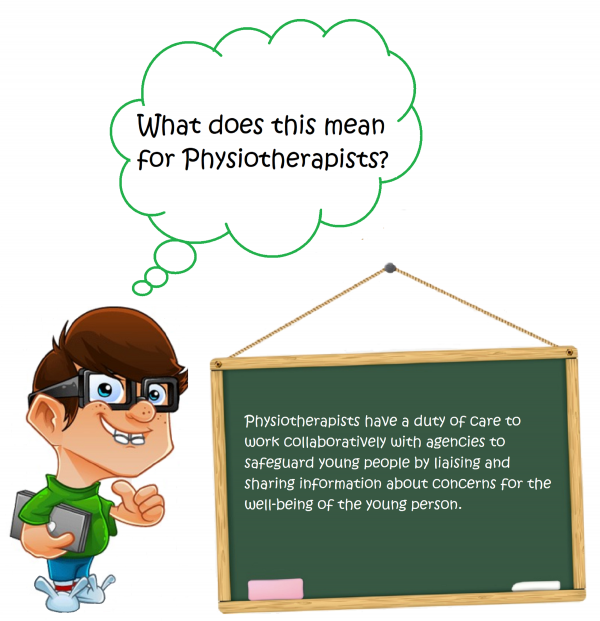 With the approach of going out to communities physiotherapists can guide and facilitate young people in communities to take control of their lives to reduce the risk of developing conditions later in life and therefore improving the quality of life for all individuals. As experts in movement and exercise, and with a thorough knowledge of functional anatomy and pathology and its effects on all systems, physiotherapists have specific competence and expertise and are ideally suited to promote, guide, prescribe and manage active living. Additional to the promotion in their current settings waiting for the patients to come in order to reach a larger population, physiotherapists need to immerse themselves more widely in the community to tackle sedentary lifestyles proactively and prevent their associated co-morbidities. Physical education programmes at schools have been identified as an important tool to increase the awareness of health-enhancing physical activity . Evidence suggests the quality of such programmes is of importance for their outcome . With extensive knowledge of promoting, guiding, prescribing and managing physical activity for young people with different needs, physiotherapists are excellent partners to develop, implement and follow-up high-quality physical education programmes in schools and community centres. This movement, additional to the individual patients seen will allow for a wider population to be targeted, which is paramount given the statistics relating to sedentary behaviour. Establishing routine physical activity as an adolescent is associated with an increased probability to continue this behaviour into adulthood and a reduced risk of disease . However, with nearly half of young people aged 10-24 not achieving the recommended physical activity guidelines , the healthcare costs to communities and the NHS are under strain. In Scotland, physical inactivity causes 2500 deaths per year and costs the NHS £91 million per year . In the UK, the levels of physical inactivity in young people will result in predicted diseases, decreased quality of life and reduced lifespan. The economic costs of these anticipated morbidities are estimated in Figure 5. If the total number of young people meeting physical activity guidelines could increase by only 1%, the UK could save £0.8 billion. 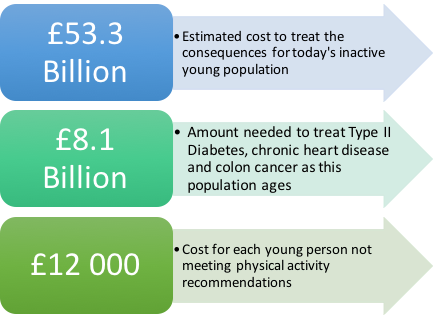 Figure 6 displays the viable economic savings associated with young people’s increase in physical activity. Knowledge and understanding of relevant legal frameworks, including local policies are essential for Physiotherapists who work with young people to ensure they work effectively and deliver services appropriately . Central to the Children and Young People (Scotland) Act 2014 , is the ‘Getting It Right for Every Child (GIRFEC)’ policy . This policy states that all adults working with children and young people should ensure their actions support the best interest of children and young people through promoting, supporting and safeguarding well-being and reporting on well-being outcomes . Integrated Working: focuses on children, young people, parents and services they need working together in a coordinated way to meet the specific needs and to improve overall well-being. Child Focused: ensures the child or young person (and their family) are at the centre of decision-making and have appropriate support available to them. Well-being of Children: focuses on a child or young person’s overall well-being. Early Interventions: focuses on tackling the needs of a child and young person early, aiming to ensure the needs are identified as early as possible to avoid larger concerns and problems to develop. The well-being of children and young people is at the heart of GIRFEC . The approach uses eight areas of well-being, called SHANARRI indicators, which represent the basic requirements for all children and young people to grow and develop to reach their full potential. The eight SHANARRI indicators of the GIRFEC well-being wheel are illustrated in below . The Ready to Act Plan  is the first children and young people’s services plan in Scotland to focus on the support provided by AHPs. The plan sets the direction of travel for the design and delivery of AHP services to meet the well-being needs of young people. It is underpinned by the Children and Young People (Scotland) Act 2014 , the principles of Getting it Right for Every Child (GIRFEC)  and the United Nations Convention on the Rights of the Child . The Children and Young People (Scotland) Act 2014  establishes a legal framework within which services create new and dynamic partnerships to support young people, their parents, carers and families to achieve meaningful well-being outcomes  . These outcomes include what has come to be known as the SHANARRI indicators of well-being. AHPs, including physiotherapists, play a key role in young people achieving well-being outcomes through developing their resilience and creating protective environments to enable participation and self-reliance . Safeguarding is a term which is broader than ‘child protection’ and relates to the action taken to promote the welfare of young people and protect them from harm . Safeguarding is everyone’s responsibility. Children and young people with capacity: A young person under 16 who has the capacity to make their own decisions may be referred to as ‘Gillick competent’ after the legal case that established children can make their own decisions in certain circumstances . Children and young people over the age of 16: All 16-17 year olds with capacity are permitted by law to give their own consent to health interventions . Those young people who are 16 or over on the date they attend for treatment do not need parental consent for Physiotherapy . You should not share confidential information about 16-17 year olds with their parents, or others, unless you have specific permission to do so and/or you are legally obliged to. According to Scottish law, children over the age of 12 are usually considered to be sufficiently mature to form a view and can have the legal capacity to consent to health interventions, where in the opinion of a qualified health practitioner, the child is capable of understanding the nature and possible consequences of the intervention . Confidentiality is of fundamental importance to young people as outlined in the United Nations Convention on the Rights of the Child . Young people have the same rights to confidentiality as adults, however the duty to safeguard young people should come first   . When obtaining consent, confidentiality needs to be explained to young people in terms that they understand and that they are aware of events in which the physiotherapist may be required to act on concerning information and pass it on to relevant organisations . In addition, parents of young people may request access to the young person’s responses after undertaking a health intervention, questionnaire or survey. There are strong ethical reasons why parents should not have access to what their child says on a questionnaire, as young children may be harmed, embarrassed or punished based on the responses they have given . Rather than giving parents access to responses, it may be beneficial to offer parents to view the questionnaire prior to it being completed  or to encourage parents to initiate discussions about the questionnaire with their children in a home setting . The Scottish Government was one of the first countries in the world to release a national physical activity strategy, by providing a broad framework and implementation plan, called 'Lets Make Scotland More Active' in 2003 . The five-year review of the 20-year strategy acknowledged there has been progress made increasing the levels of physical activity. It has been followed up recently after the 2014 commonwealth games with the strategy 'A More Active Scotland' . This is an adaptation of 'The Toronto Charter for Physical Activity' (2010) which is a global call for increased physical activity levels and the need for health professionals to promote this change in behaviour . This aimed to be achieved through legacies with over 50 being launched since their inception. Legacies are part of the implementation plan and examples include: a national week encouraging increased female participation in sport, as they have been found to be less active than males. The statistics show young peoples physical activity have slightly increased both including and excluding the increased physical activity in schools. 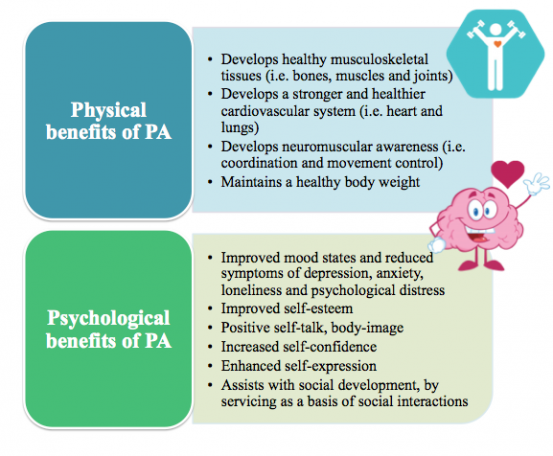 It is still unclear however what impact this has on long-term active living and whether this increase in PA is carrying on into adulthood. Behaviour change involves influencing health-related knowledge, attitudes and behaviours and should be targeted at an individual, household, population or community . With an ever-changing health system, it is widely believed that by addressing problem behaviours early this can have an impact on the development of co-morbidities and mortality in later life which influences quality of life . In addition, these healthy changes reduce the risk of preventable diseases which place a huge economic burden on our health-system . The behavioural science/medicine literature has been growing exponentially in recent years with the National Institute for Health and Clinical Excellence and many academic researchers producing evidence-based behavioural health treatments and guidance for health professionals . In their latest corporate strategy (2017-2020)  for physiotherapy, the CSP have acknowledged the role physiotherapists will play in empowering individuals in communities to take control of their own lives to stay healthy for longer. This will involve physiotherapists using expert knowledge in human movement and health promotion to implement effective health-related behavioural change strategies in a preventative way among different populations. One of the fundamental problems with behaviour change and health promotion however is indeed its application into practice . Based on the science of behaviour a large amount of literature has been published examining the effectiveness of several behaviour change models. These models have been developed to conceptualise the overwhelming amount and complexity of behavioural change theory and to help our understanding of the dynamic interrelationships that are necessary for sustained active living. With the use of these model’s health professionals can systematically implement change. They are broken down into the following: Social-Cognitive theory, Belief /Attitude theories (Theory of Planned Behaviour), Competence-based theories (Self-Efficacy Theory), Control-based theories (Self-Determination Theory), Stage-based theories (Transtheoretical Model) and other hybrid models . 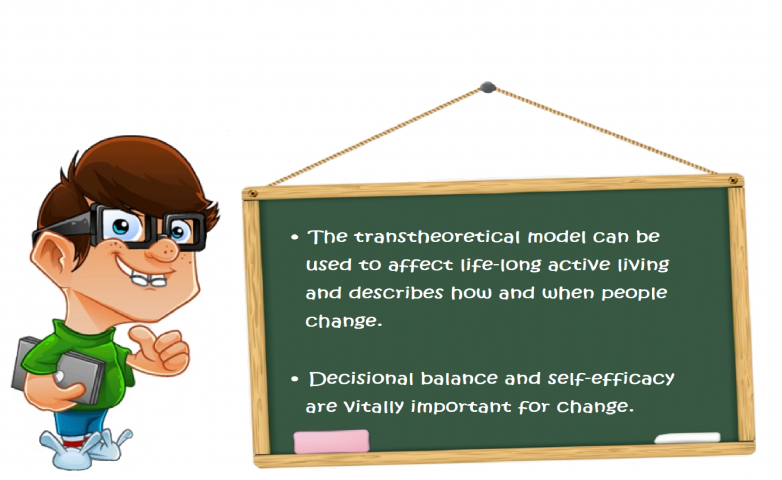 Although there is a vast array of theory to choose from, the stage-based model (Transtheoretical model-TTM) is arguably the most commonly used in behaviour change. The following section will focus on the TTM and how this framework can be used in the process of behaviour change. The Transtheoretical Model (TTM), first proposed by Prochaska and DiClemente (1983) , is a process-oriented framework for understanding and implementing effective health behaviour change . This model brings together many psychotherapy theories in one concise framework to establish a person/groups ‘readiness to change’ (Biopsychosocial) . As Marcus and Forsyth (2003)  wrote, quite often “physical readiness is not likely to be the main barrier to activity; rather it is the psychological readiness to change”. Due to the heterogeneity of humans, many people have different readiness to change and therefore require interventions that reflect the natural cycles of health-related behaviour change. The fundamental purpose of the TTM is to systematically affect lifelong active living and it describes when and how people change . 2. Independent variables (Processes of Change). There are five stages of change in the TTM (Table 2) which categorizes people based on how active they are. In the first stage, precontemplation, individuals are not participating in any activity nor do they have any intention to change these habits. As they are unaware of the consequences of their behaviours much of the work in this stage should focus on motivational interviewing, decisional balance/self-efficacy work (education). In the contemplation stage, individuals are still not active, but they are more aware of the benefits of changing their behaviour and are beginning to think about how to change. The preparation stage involves irregular activity as the individuals begin to prepare their lives for change within the next month . Once individuals are consistently active they are said to be in the action stage. It is at this point that the probability of relapse is highest and therefore it is vitally important for individuals to take advantage of any opportunities to maintain their new healthy behaviours. The final stage of the TTM is the maintenance stage and this is ultimately the end goal of an intervention. Individuals who are at this stage must be consistently performing their new behaviours for at least six months. The stages of change are often described as a cyclical process as individuals jump between stages as they progress . The Processes of change are concerned with ‘how’ individuals change  There are ten processes of change (Table 2) and the choice of the most appropriate strategy is based on the stage of change that the individuals are in. 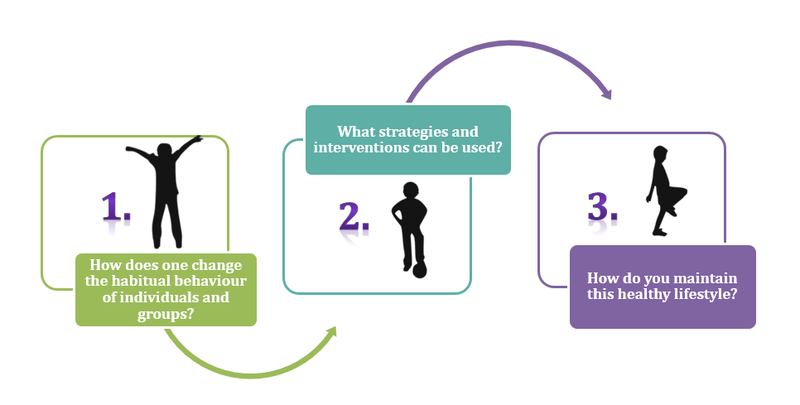 Once a SOC has been established physiotherapists can use the processes of change to design appropriate interventions/strategies for effective behaviour change. At a higher order structure these processes are sub-divided into experiential (cognitive-affective) and behavioural processes . In their study Romain and colleagues (2018)  propose that public health interventions should use a combination of experiential and behavioural processes of change to achieve moderate physical activity levels and sustained active living among individuals. The first five processes are experiential and are concerned with thinking about an activity/new behaviour whereas the last five are behavioural processes which involve action . Decisional balance, first proposed by Janis and Mann (1977) , is one of the core constructs for progression through the TTM. It is concerned with the pros (perceived advantages) and cons (perceived disadvantages) of changing behaviour  .Several studies have shown a strong relationship between decisional balance and an individual’s readiness to increase physical activity . As individuals move through the SOC from precontemplation to maintenance the balance shifts in favour of the pros of changing behaviour. Interestingly in the contemplation stage the pros and cons are of equal weight which may leave individuals ambivalent to change. It can be argued that an emphasis should be placed on education and motivational interviewing at these stages to increase adherence and decrease opposition . Self-efficacy, first proposed by Bandura and colleagues (1977) , can be defined as “an individuals belief in his or her ability to perform a specific action required to attain a desired outcome”  p. 176. Self-efficacy is part of social-cognitive theory and a key construct of the TTM. Young people with high PA self-efficacy typically participate in activity for longer periods of time and therefore it is vitally important for sustained active living. With a higher self-efficacy, individuals try harder to achieve their goals, can conquer barriers and set-backs and will look to maintain their healthy behaviours throughout life . This personal component can be improved throughout health-behaviour change as individuals progress through the SOC. In the early SOC the self-efficacy to participate in physical activity is outweighed by the temptations to stay physically inactive. Individuals are said to lack the confidence in themselves to change their behaviours. Work is required through education and support /guidance to increase this self-esteem. In the later stages of health-behaviour change realistic goal setting the creation of social support systems become more important as individuals look to maintain this new active lifestyle. The probability of relapse in this population is quite high due to other social factors that may come into play at this age. Studies have shown decreases of 7% in PA in young people (11-18year olds) each year  with an estimated 60-70% decline globally as they transition into adulthood. Self-efficacy and social support have been widely acknowledged as key determinants of PA  and it is hypothesized that these components work interchangeably during adolescence  to prevent relapse. If an adolescent’s self-efficacy is low, social support systems may compensate . At this age peer support becomes more important as adolescents move away from the comforts of parental support and begin to independently make decisions . Now that the background reading is complete lets look at the practical element of the resource, how physiotherapists can implement behaviour change. In the following sections there is an adapted questionnaire and guided scoring system to establish where young people are in the readiness to change model (TTM-SOC). 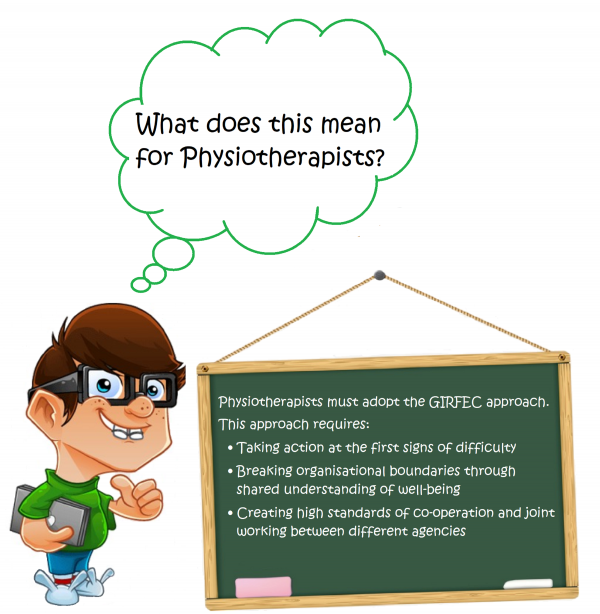 There is then a framework to guide physiotherapists in their role as a facilitator for progression through the model towards the maintenance phase and an active lifestyle. A number of strategies are presented to enable early progression which include: motivational interviewing and decisional balance/self-efficacy work. In the later stages, and for long-term maintenance, self-management and future technologies are explored as strategies to strengthen this progression. Finally, sign-posting/resources are available at the bottom to give physiotherapists ideas of ways to empower individuals/groups in community-based interventions. Once all reading is complete the the physiotherapist should critically reflect on learning and future areas for development prompted by the questions at the end. With this in mind an comprehensive action plan is advised encouraging the physiotherapist to design, plan and implement a timed action plan. 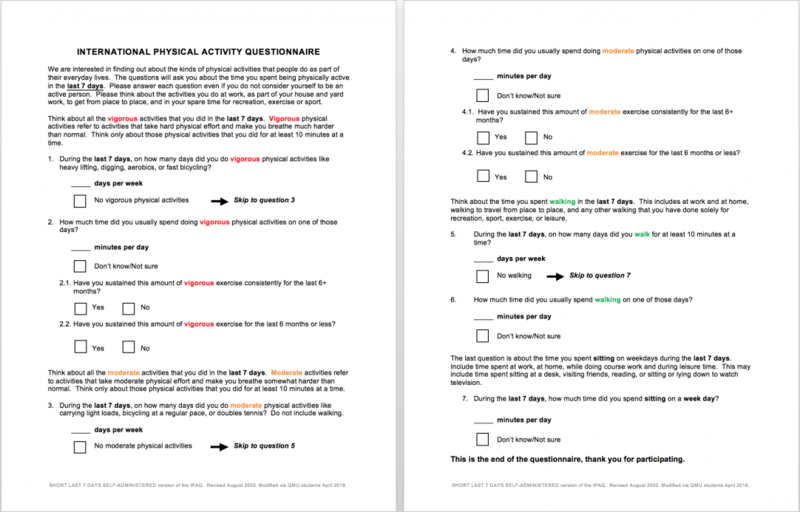 The following questionnaire is a modified version of the International Physical Activity Questionnaire short form (IPAQ-SF) , comprising of seven questions. The aim of this questionnaire is to assist in identifying which stage of the Transtheoretical model the adolescent participants are in. 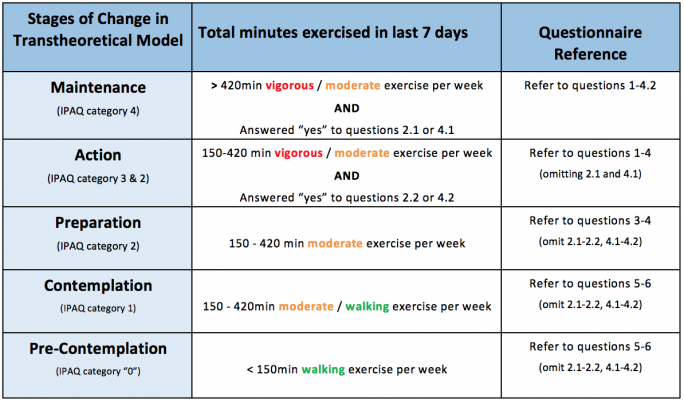 After the total minutes of vigorous, moderate or walking activities performed over the participant's last seven days have been calculated, the physiotherapist can utilise the marking scheme provided in table 3 to establish which stage of the Transtheoretical model the participant is in. Although this modified IPAQ-SF is answered on an individual basis, this questionnaire may be administered in group community settings, resulting in small groups of participants allocated into their individual stages of behaviour change. A critical evaluation of the literature has shown a lack of consensus in the evidence for this assessment in adults. A large-scale study investigating the reliability and validity in 12 countries found the questionnaire to be an acceptable instrument with equal effectiveness compared to other questionnaires . In contrast, a systematic review found the IPAQ-SF typically overestimated physical activity and concluded it to be a weak measure . The evidence is more robust with adolescents, as a significant correlation was found between the questionnaire and moderate vigorous physical activity recorded on an accelerometer . Another study investigating it's use in adolescents found the IPAQ-SF to be valid and reliable measure of physical activity . Modification of the IPAQ-SF  was performed by QMU students in April 2018. Alterations included asking the participant to record the total "minutes per day" of activities performed and excluding "hours per day". This was done on the basis that UK physical activity guidelines are calculated in minutes, not hours , therefore simplifying the marking process for the physiotherapist, especially when fast calculation of multiple questionnaires are required. Additionally, questions 2.1, 2.2, 4.1 and 4.2 were added to facilitate a simple "yes" or "no" criteria for the scoring into the "maintenance" or "action" stages in the transtheoretical model. 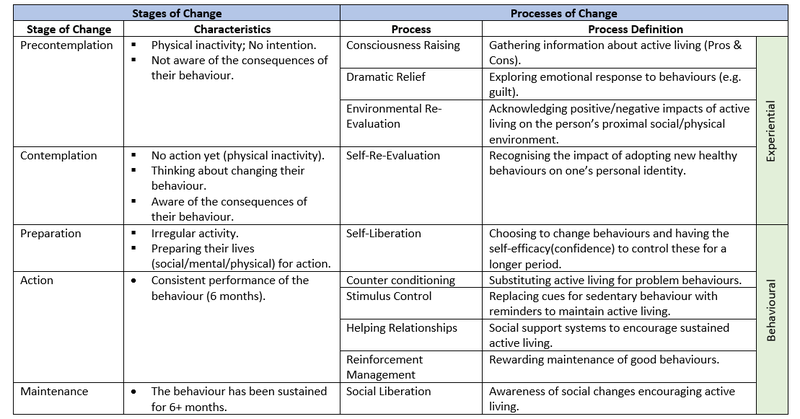 The following table depicts the marking criteria for the identification of behavioural change stages in the transtheoretical model. Calculate total number of minutes exercised in the last 7 days for vigorous, moderate and walking intensities. Using the table above, classify the participant into the corresponding Transtheoretical Stage of Change using the total number of minutes exercised in accordance to level of intensity. Please note that the participant may be placed into the “maintenance” or “action” phase if they answered yes to corresponding questions 2.1-2.2 or 4.1-4.2. Once the physiotherapist has established at which stage the young person is at they then have to find ways to facilitate their progression through the stages to achieve the ultimate goal of sustained active living. 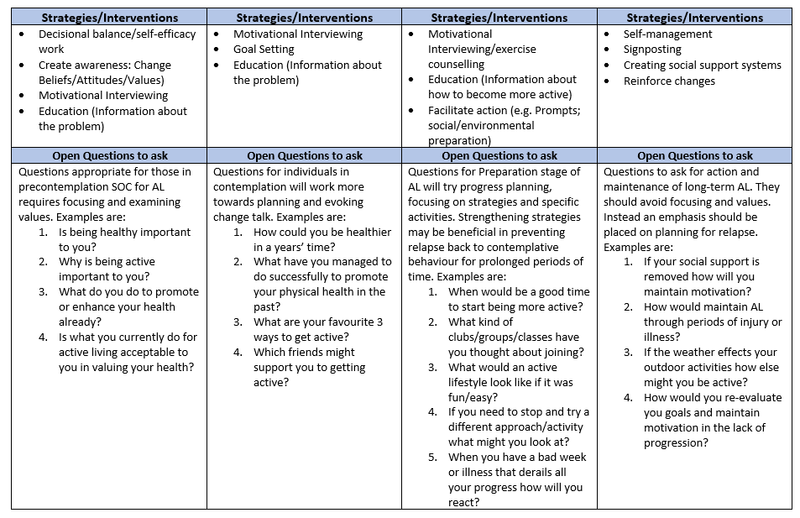 The following figure and table give examples of strategies/interventions and open questions that can be used at each stage of the TTM to help progress onto the next stage. In the table there is a particular focus on the open questions that can be used by physiotherapists to get young people thinking about their behaviours and how they could change. Some of the most important strategies/interventions will then be discussed in greater detail. Motivational interviewing (MI) is a technique for helping people to change their desired behaviour. MI can be defined as a collaborative conversation style for strengthening a person’s own motivation and commitment to change . MI is a useful technique often selected to progress individuals through the stages of TTM-SOC mentioned previously which can help to promote behaviour change and results in progression towards active living . In addition, the earlier stages of change (precontemplation and contemplation) often are linked with ambivalence, which is defined as having mixed thoughts. MI is especially useful in the earlier stages of change as it promotes the exploration and resolution of ambivalence to change by highlighting and increasing an individual’s perceived discrepancy between current behaviour, personal goals and values . Motivational interviewing can be used as a tool to enhance intrinsic motivation, which begins to initiate and maintain behaviour change efforts. Physiotherapists can use MI to facilitate behaviour change processes by being empathetic, supportive and administer counselling strategies that facilitates an increase in self-efficacy and in turn result in improved feelings of accomplishment that are needed to get to and stay in the action and maintenance stages of change . Miller and Rollnick (2001) have described four principles and five counselling strategies that are key to the MI approach as shown below. To highlight discrepancies in one’s own perceived behaviour by the individual examining the advantages and disadvantages of not changing current behaviours. As the individual becomes more aware of the discrepancies, the individual then begins to generate rationales or arguments for needing to make a change. Physiotherapist can guide this through use of the five counselling strategies. When resistance is detected, instead of ignoring or fighting it, the physiotherapist uses the individual’s resistance by employing one or more MI strategies such as simply reflecting on the individual’s concern or reframing the issue so that the individual does not feel defeated, anxious, angry about sharing his/her concerns. One of the most valuable skills in MI for the physiotherapist is reflective listening. It is important for the physiotherapist to actively listen to the individual without being judgemental, critical or blaming to better understand the individual’s situation and perspective. Physiotherapists must understand that an individual who is in an earlier stage of change may not be ready to give up their current behaviours just yet. The initial focus is on building a rapport and supporting the individual rather than on directly promoting change. Physiotherapists help support and build an individual’s confidence in having the ability to change in a variety of ways. Self-efficacy is enhanced by a positive individual-physiotherapist relationship in which the individual feels understood and supported. Other approaches are presenting the client with the examples of positive changes she/he made in the past and highlighting client’s courage in considering choices and taking responsibility. Open questions: open questions as opposed to closed ones promote discussion and exploration. Examples of such open questions are included in this Wiki to help physiotherapists to choose what to ask at each SOC. These questions will help people to reflect and move past their ambivalence to change. Affirmations: convey respect and appreciation as well as highlight individual’s success. 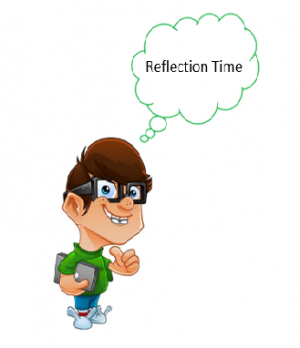 Reflections: selectively used to convey an understanding of the individual’s perspective and reinforce motivation and can be several types including simple, amplified, double sided and reframes. Summaries: providing a summary on the current topics discussed, highlights to the client the current stages of change. 1. Desire to change: Individuals must have the willingness to change before the process can even begin. 4. Commitment to change: Through increase intrinsic motivation and self-efficacy support through MI process an individual can make the decision to stay committed to the change and result in positive outcome. In summary, the task of the physiotherapist is to help the individual resolve their ambivalence to change by “tipping the balance of the saddle” in the favor of change and reinforcing the individual’s responses that indicate desire, ability, need and reasons for change . As Blaise Pascal wrote “‘People are generally better persuaded by the reasons they have themselves discovered than by those which have come into the minds of others” p.1. Once this is established, the physiotherapist than shifts to further support the individual in their commitment to change by helping the individual set goals and develop a specific health-behaviour change plan. Traditionally, MI has been utilized for behaviour change on an individual basis. However as the role of physiotherapists and other allied health care professionals are extending into the community to implement proactive care, MI has been more recently adapted to be used for groups. Velasquez et al. (2009)  suggests that to efficiently utilize MI into group settings special considerations need to be explored. 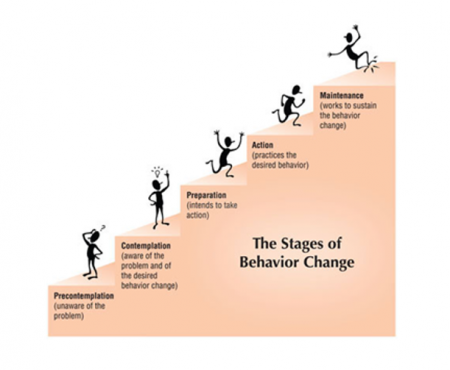 Dividing groups into the different stages of behaviour change is essential. Hence, by using the modified version of the IPAQ and clinical reasoning skills, individuals can be placed into separate groups corresponding to what stage of change the individual is currently in. In order to effectively carry out MI in a group format, all individuals in the group are encouraged to share views and experiences as a means of providing learning opportunities for the group and setting ground rules for the group discussion. If however, individuals at any point feel that their views/experiences are feeding back as judgemental/critical rather than empathetic –a resistance to share may develop. As previously mentioned, one of the principles of MI is to ‘Roll with Resistance’ and can be adapted to the group settings by the physiotherapists creating an atmosphere for mutual respect, collaboration, models of positive ways of providing feedback and gently redirect less helpful comments and responses . In addition, it is very important to elicit reasons for changes for each individual in the group to emphasize the heterogeneity in the group . Lastly, the knowledge and skill set of physiotherapists is shared, however the willingness to change is the responsibility of the individuals in the group . This process will be performed with the use of open questions which require the group to think about their lives and behaviours. Physiotherapists and their delivery of MI may be hugely effective in maximizing behavioral change for young people and their families. A study by Grays and steele (2014) found MI to be an effective intervention for promoting health-related behaviour change in the paediatric population and is most influential when done with both parent and child. Furthermore, physiotherapists skilled in MI and trained in its education may teach it to other health care workers, P.E teachers, coaches and other partners to aid them in helping young people to have more active lifestyles. Long-term adherence to health-related behaviour change is relatively poor which provides a challenge for interventions to achieve sustained active living . Although a positive adherence is seen initially several authors have described a gradual decline in the maintenance of this adherence as individuals progress through the SOC . Once adolescents have reached the action and maintenance SOC the question remains as to how we ensure that these new behaviours are sustained into adulthood? 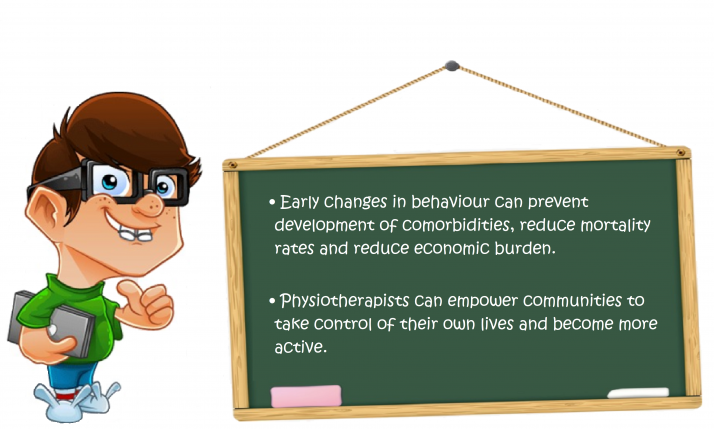 Physiotherapists can facilitate the process of health-behaviour change  and the empowerment of communities by providing individuals or groups with the skills and knowledge to take control of their lives and ultimately rely less on health professionals . In the 2020 workforce vision for Scotland  it has been stated that NHS Scotland will strive to have an “integrated health and social care system that will focus on prevention, anticipation and supported self-management” . With this proactive/preventative community-based approach to healthy living it is believed that the risk of developing non-communicable diseases could be prevented before adolescent’s progress into adulthood. It is therefore imperative to maintain this change with effective self-management. There are a number of strategies/interventions that can be used to initiate self-management for sustained active living in young people which include the following: self-reinforcement, relapse prevention, problem-solving skills training and the creation of good peer support systems. Self-reinforcement involves both the intrinsic (e.g. feelings of enjoyment or achievement) and extrinsic (e.g. money) rewards of changing behaviour . This positive reinforcement concept can act as a highly effective motivator for young people to stay active as they are perceived to gain something from persistence and lose something for relapsing. Realistic goal setting is often used as a method of self-reinforcement to give people a sense of achievement once the goals have been reached. Another method that can be used is self-reflection/evaluation whereby individuals critically assess how far they have come since they started their change. Relapse prevention involves providing individuals/groups with the necessary skills to avoid “high risk” situations that have a high probability of relapse . The idea is that by providing guidance on coping strategies for lapses it is possible to revert the situation quickly before individuals relapse to old problem behaviours. Development of positive thoughts regarding the problem behaviour and the ability to manage it. Recognition of problem and its characteristics/attributes. A strong relationship exists between physical activity adherence and social support. It has been shown that the risk of non-adherence is twice as high in those with no social support . A solution to this problem is the use of group-based interventions to create peer support systems. A large amount of research has shown the effectiveness of group-based interventions . It has been suggested by Middleton and colleagues (2013) that recruiting friends and family to help in health behaviour change can be beneficial for adherence. In addition, these authors proposed the idea of performing lifestyle changes in group situations to increase peer support. In her study Lindqvist (2017) examined the role physiotherapists can play in health promotion in a community setting (i.e. school) using social-cognitive theory, empowerment interventions and communication technology. In these interventions, created by the children, participants agreed to send reminders and messages of encouragement to their peers regarding physical activity and set goals. It was found that encouragement from peers was beneficial for PA adherence and that activities should be cater for all likes and dislikes. Sport England have chosen 12 grassroots pilot projects to help build healthier more active communities across England. Over a period of four years £100m of national lottery funding will be invested in these pilot projects to create innovative solutions to make physical activity more accessible to people in these communities. The aim is to address inequalities and break down barriers that stop people getting active and encourage wider, collaborative partnerships which look at how all parts of a community can better work together and help the inactive. These partnerships will encompass organisations such as voluntary groups, social enterprises, faith organisations and parenting groups. The improvements will include transport links, street lighting, increased quality of parks and open spaces and guidance on how sport and activity is promoted by health professionals. Key elements of Sport England’s work with young people are focused on easing transitions so that short-term lapses in participation do not become longer-term loss of habit. “Back to...” programmes have been successful increasing interest in particular sports such as netball and hockey. The focus is not just on better sign-posting through transitions but rather on changing behaviour with better opportunities that respond to the motivations of individuals as opposed to just lowering the practical barriers. If inactive youths begin to associate ‘sport’ with things they really want to do, such as meeting their friends, relaxing and de-stressing from everyday life, they are much more likely to participate. Sport England are also using their funding to encourage sport deliverers to think differently, to make sport more accessible and participation less formal. An example of this is the investment of £500k in an innovative programme designed to get new people into sport using the National Trust brand and the idyllic settings of their properties. One of the key features of the strategy is making sure children as young as 5 are able to enjoy physical activity and making sure experiences are enjoyable and fun. Sport England have invested a £40 million ‘Families Fund’ in projects that offer opportunities for families with children to do sport and physical activity together. Investments will also be made into free teacher training programmes, improving physical education experiences, support for satellite clubs and recognising the importance of transitions between primary and post-primary schools. Public Health England and the NHS’s ‘Change4Life’ campaign develops and implements programmes and initiatives designed to increase physical activity in youths. Change4Life uses high profile campaigns and partnerships with local authorities, schools and the commercial sector to encourage youths to achieve their guideline of 60 active minutes. There are also now Change4Life Sports Clubs in over 6,500 primary schools and all 3000 Secondary Schools. Change4Life also have a number of resources and tips available on their website for leading a more active life. The National Institute for Health and Clinical Excellence Centre (NICE) consistently promote the benefits of healthy lifestyles across the curriculum at primary, secondary and higher education levels, and the benefits of group activities along with promoting campaigns for cycling and walking to school. Centres for Disease Control and Prevention have developed an easy-to-read leaflet that can be given to parents to encourage and develop ideas on how to get their child to lead a more active lifestyle outside of school. Parkrun is a locally-led and voluntarily-run weekly free 5km timed runs in parks throughout the country. They are open to people to all ages and standards. Alliance for a Healthier Generation is a US organisation which has developed a ‘Healthy Out-of-School Time’ initiative to give out-of-school time providers a science-based framework designed to help create environments where youth are encouraged to eat healthier and move more. An assessment tool is provided to track what you are already doing to support health and wellness and highlight opportunities and strategies for growth and improvement. Given that many young people constantly use mobile phones on a daily basis, mobile phones can be a viable tool to promote an active lifestyle and deliver positive health interventions . Mobile Apps can be selected according to individual needs of the participant and can be a fun, interactive, cost-effective and social platform to encourage a more active lifestyle . Apps can enable users to set targets, enhance self‐monitoring, and increase awareness . Active 10 Walker: An NHS approved app for people looking for easy ways to add activity to their day and improve their health by getting into the habit of walking briskly for 10 minutes every day. Couch to 5k: An NHS approved app designed to get people off the couch and running 5km in 9 weeks. Dungeon Runner Fitness Quest: The user progresses through the game by fighting enemies with punches, opening secret passages with squats and avoiding traps with ski-jumps. This app incorporates motion-tracked exercises through the gram to encourage physical activity. Rise & Recharge: Developed to help reduce sitting time and encourage regular movement. Geocaching ®: Geocaching is a real-world, outdoor treasure hunting game using GPS-enabled devices. Participants navigate to a specific set of GPS coordinates and then attempt to find a container hidden at that location. Zombies, Run! 5 K Training: A training program, with a series of missions , whereby the user runs and listens to various audio narrations to collect virtual supplies and gets fit to escape the zombies. Charity Miles: Earn money for charities every time you run, walk, or bicycle. Corporate sponsors agree to donate a few pennies for every mile you complete. Fitnett: An abundance of five to seven-minute targeted workouts. The app also incorporates the phone’s camera to measure how closely the participant follows the moves on the screen. Pokémon Go: Encourages people to get off the couch and become more active by exploring the outside world. Participants complete a variety of objectives with the opportunity to earn rewards and discover various Pokémon. Ingress: Transforms the real world into a landscape for a global game of mystery, intrigue, and competition. The app encourages users to get off the couch and become active by trying to complete objectives and take over hack points. Sworkit: A number of built-in exercise regimens, including yoga, that simply gets people moving all the way up to 60 minute work-outs. The work outs can be personalised with over 160 exercises. Strava: Tracks running and riding with GPS, offers options to join challenges, share photos from activities and follow friends activities. Q.1 What questions would you ask at each stage of the TTM? Q.2 What interventions could you implement to move young people onto the maintenance phase? Q.3 What kind of factors should be focused on when trying to encourage young people to remain in the maintenance stage? Q.4 What current local strategies are in place near you? Q.5 How can these be used to encourage young people into active living? The increase of habitual sedentary behaviour and physical inactivity within the young population is a major contributor to the development of chronic health conditions and increased mortality rates in later life. Promoting an active lifestyle in the young population could reduce these risks and assist in carrying healthy behaviours into adulthood. Physiotherapists are ideally placed to play a crucial proactive role in promoting and facilitating an active lifestyle in the young population. As the roles and responsibilities of physiotherapists are emerging there has been a shift away from the traditional clinical setting to a more community-based approach. In this setting physiotherapists can act as facilitators for the adoption of active living in a wider population, thus making a larger positive impact in the young population. Administering tools, such as the modified IPAQ-SF, in a community setting enable physiotherapists to identify which stage of the TTM of behaviour change young people are in. 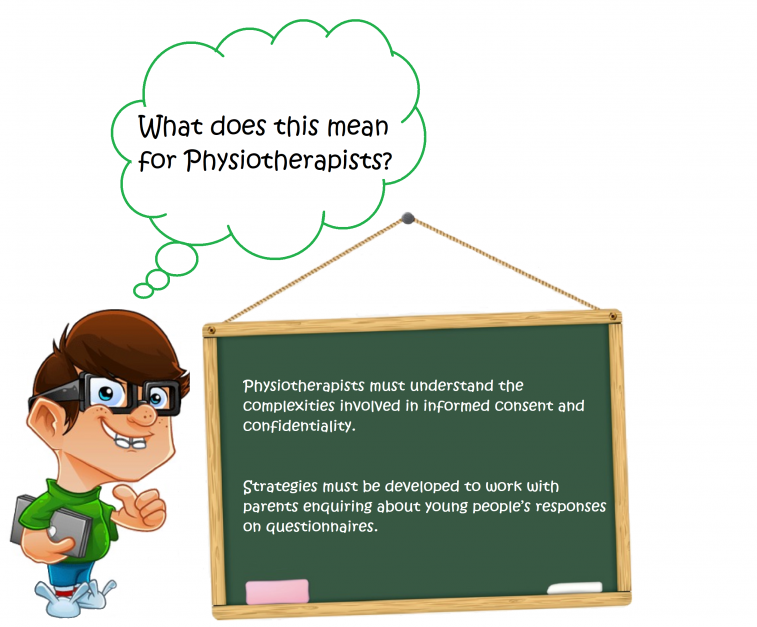 This is crucial, as physiotherapists can utilise their skills and knowledge, such as motivational interviewing and signposting, to promote and encourage an active lifestyle to young people in the early stages of the TTM. 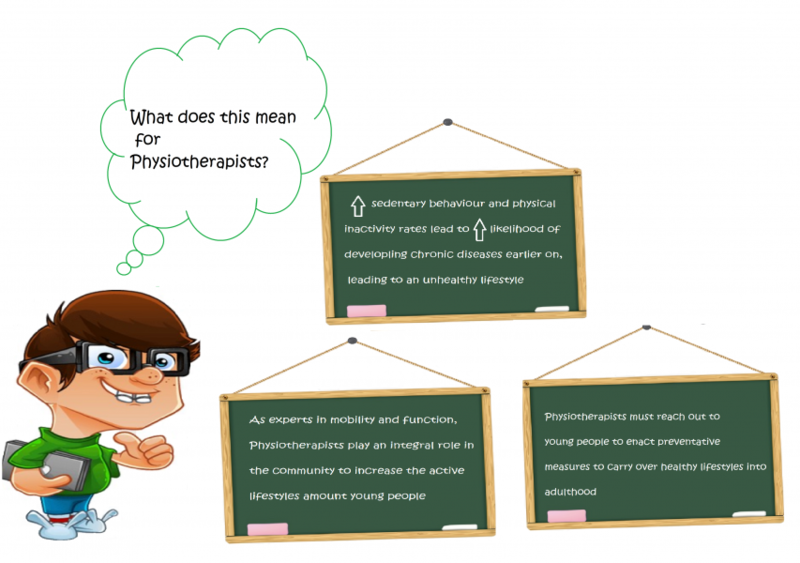 Additionally, for young people identified in the maintenance stage of the TTM, physiotherapists can utilise individualised strategies to enable young people to stay in this stage, rather than regressing. 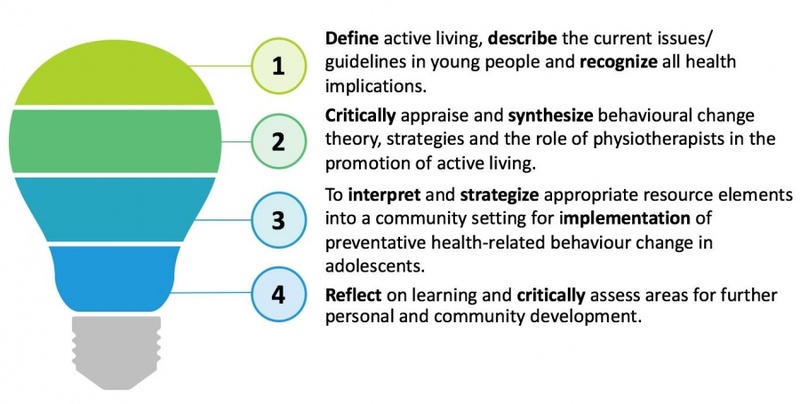 As behaviours of active living established in young years can greatly impact on maintaining positive habits across a person’s lifespan, It is of the utmost importance to enable young people to stay in the maintenance stage, thus potentially decreasing the future risks of chronic health and early mortality rates. As role models of healthy living physiotherapists will play a role in positively influencing decisions that impact on the health and well-being of communities. As the saying goes "prevention is better than cure" and physiotherapists have a role and responsibility to do more to prevent people having to present at emergency and out-patient settings due to non-communicable diseases. ↑ 1.0 1.1 Telama R, Yang X, Viikari J, Välimäki I, Wanne O, Raitakari O. 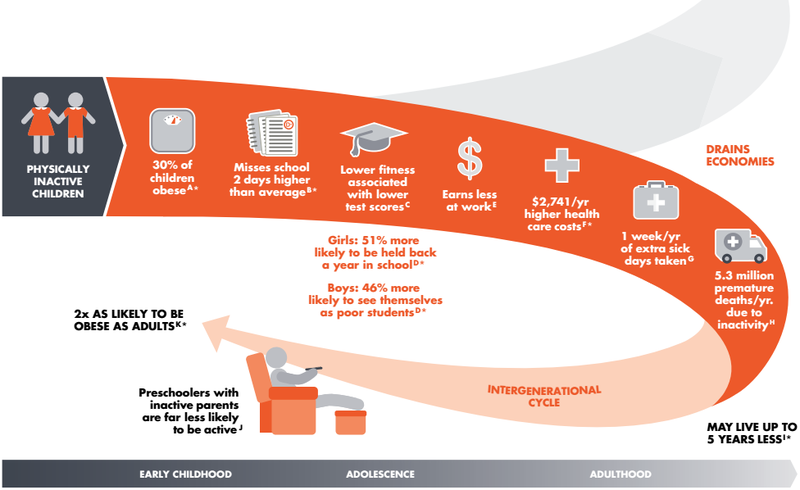 Physical activity from childhood to adulthood. American journal of preventive medicine. 2005 Apr 1;28(3):267-73. ↑ Ogden CL, Carroll MD, Kit BK, Flegal KM. Prevalence of obesity and trends in body mass index among US children and adolescents, 1999-2010. Jama. 2012 Feb 1;307(5):483-90. ↑ Hills AP, King NA, Armstrong TP. The contribution of physical activity and sedentary behaviours to the growth and development of children and adolescents. Sports medicine. 2007 Jun 1;37(6):533-45. ↑ 5.0 5.1 5.2 5.3 European Region of the World Confederation for Physical Therapy Promoting Physical Activity in Children, the Role of Physiotherapists. [ebook] EU Platform for Action on Diet, Physical Activity and Health. 2018 January 11. Available at: http://www.erwcpt.eu/file/164 [Accessed 05/10/18). ↑ 6.0 6.1 6.2 Ding D, Lawson KD, Kolbe-Alexander TL, Finkelstein EA, Katzmarzyk PT, Van Mechelen W, Pratt M, Lancet Physical Activity Series 2 Executive Committee. The economic burden of physical inactivity: a global analysis of major non-communicable diseases. The Lancet. 2016 Sep 24;388(10051):1311-24. ↑ 7.0 7.1 7.2 Active SA. 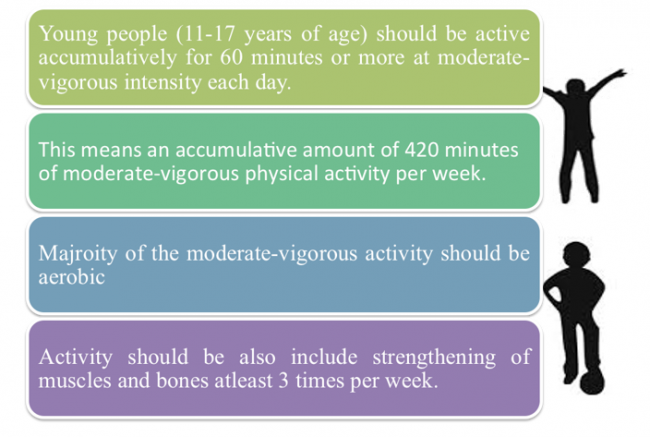 A report on physical activity for health from the four home countries’ Chief Medical Officers. The Department of Health. 2011. ↑ 8.0 8.1 World Health organization WHO. Global Health Risks-Mortality and burden of disease attributable to selected major risks. Cancer. 2017 Feb 3. ↑ Hallal PC, Victora CG, Azevedo MR, Wells JC. Adolescent physical activity and health. Sports medicine. 2006 Dec 1;36(12):1019-30. ↑ Halfon N, Verhoef PA, Kuo AA. Childhood antecedents to adult cardiovascular disease. Pediatrics in Review. 2012 Feb;33(2):51-60. ↑ Beckman H, Hawley S, Bishop T. Application of theory-based health behavior change techniques to the prevention of obesity in children. Journal of Pediatric Nursing. 2006 Aug 1;21(4):266-75. ↑ Kater KJ, Rohwer J, Levine MP. An elementary school project for developing healthy body image and reducing risk factors for unhealthy and disordered eating. Eating Disorders. 2000 Mar 1;8(1):3-16. ↑ Paffenbarger Jr RS, Hyde R, Wing AL, Hsieh CC. Physical activity, all-cause mortality, and longevity of college alumni. New England journal of medicine. 1986 Mar 6;314(10):605-13. ↑ Harold W. Kohl, I., Cook, H., Environment, C., Board, F. and Medicine, I. (2018). Physical Activity and Physical Education: Relationship to Growth, Development, and Health. [online] Ncbi.nlm.nih.gov. Available at: https://www.ncbi.nlm.nih.gov/books/NBK201497/\ [Accessed 22 Mar. 2018]. ↑ 15.0 15.1 15.2 Prochaska JO, DiClemente CC, Norcross JC. In search of how people change: Applications to addictive behaviours. American psychologist. 1992 Sep;47(9):1102. ↑ Telama R. Tracking of physical activity from childhood to adulthood: a review. Obesity facts. 2009;2(3):187-95. ↑ Kahlert D. Maintenance of physical activity: Do we know what we are talking about?. Preventive Medicine Reports. 2015 Jan 1;2:178-80. ↑ 21.0 21.1 Tremblay MS, Aubert S, Barnes JD, Saunders TJ, Carson V, Latimer-Cheung AE, Chastin SF, Altenburg TM, Chinapaw MJ. Sedentary behavior research network (SBRN)–terminology consensus project process and outcome. International Journal of Behavioral Nutrition and Physical Activity. 2017 Dec;14(1):75. ↑ Hoare E, Milton K, Foster C, Allender S. The associations between sedentary behaviour and mental health among adolescents: a systematic review. International journal of behavioral nutrition and physical activity. 2016 Dec;13(1):108. ↑ Biddle, S.J. and Asare, M., 2011. Physical activity and mental health in children and adolescents: a review of reviews. British journal of sports medicine, p.bjsports90185. ↑ Penedo FJ, Dahn JR. Exercise and well-being: a review of mental and physical health benefits associated with physical activity. Current opinion in psychiatry. 2005 Mar 1;18(2):189-93. ↑ Physical activity statistics [Internet]. British Heart Foundation. 2015 [cited 22 March 2018]. Available from: https://www.bhf.org.uk/publications/statistics/physical-activity-statistics-2015. ↑ 27.0 27.1 Scholes S, Mindell J. Health Survey for England 2012: Physical activity in children. London: The Health and Social Care Information Centre. 2013. ↑ 28.0 28.1 28.2 Arundell L, Fletcher E, Salmon J, Veitch J, Hinkley T. A systematic review of the prevalence of sedentary behavior during the after-school period among children aged 5-18 years. International journal of behavioral nutrition and physical activity. 2016 Dec;13(1):93. ↑ 29.0 29.1 Mitchell JA, Byun W. Sedentary behavior and health outcomes in children and adolescents. American Journal of Lifestyle Medicine. 2014 May;8(3):173-99. ↑ Boreham C, Riddoch C. The physical activity, fitness and health of children. Journal of sports sciences. 2001 Jan 1;19(12):915-29. ↑ Malina RM. Physical fitness of children and adolescents in the United States: status and secular change. InPediatric Fitness 2007 Jan 1;50:67-90. ↑ Steele RM, Brage S, Corder K, Wareham NJ, Ekelund U. Physical activity, cardiorespiratory fitness, and the metabolic syndrome in youth. Journal of Applied Physiology. 2008 Jul;105(1):342-51. ↑ Nike (2013). 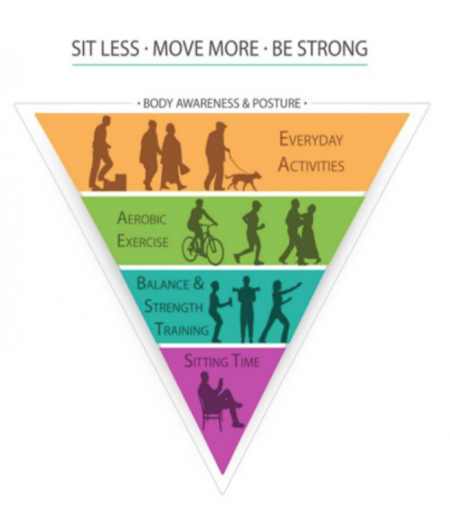 Designed to Move: A Physical Activity Action Agenda™. [image] Available at: https://clubs.marathonkids.org/keeping-kids-moving/ [Accessed 17 Mar. 2018]. ↑ Public Health England. Making every contact count [online] 2016 January. Leeds: Crown [viewed 10 April 2018] Available from: https://www.england.nhs.uk/wp-content/uploads/2014/06/mecc-guid-booklet.pdf. ↑ 35.0 35.1 Lowe A, Gee M, McLean S, Littlewood C, Lindsay C, Everett S. Physical activity promotion in physiotherapy practice: a systematic scoping review of a decade of literature. Br J Sports Med. 2016 Dec 21. ↑ Mulligan H, Fjellman-Wiklund A, Hale L, Thomas D, Häger-Ross C. Promoting physical activity for people with neurological disability: perspectives and experiences of physiotherapists. Physiotherapy theory and practice. 2011 Aug 1;27(6):399-410. ↑ McPhail S. Multi-morbidity, obesity and quality of life among physically inactive Australians accessing physiotherapy clinics for musculoskeletal disorders. Physiotherapy Journal. 2015 May 1; 101:986-987. ↑ Allied Health Professional Federation and Public Health England., 2015. A strategy to develop the capacity, impact and profile of allied health professionals in public health 2015-2018. ↑ Trudeau F, Shephard RJ. Contribution of school programmes to physical activity levels and attitudes in children and adults. Sports medicine. 2005 Feb 1;35(2):89-105. ↑ Streetgames.org. (2014). [online] Available at: https://www.streetgames.org/sites/default/files/The-Inactivity-TimeBomb-StreetGames-Cebr-report-April-2014.pdf [Accessed 17 Mar. 2018]. ↑ Physical activity in children and young people [Internet]. World Health Organization. 2011 [cited 22 March 2018]. Available from: http://www.who.int/dietphysicalactivity/factsheet_young_people/en/. ↑ Beta.gov.scot. (2018). Physical activity and sport - gov.scot. [online] Available at: https://beta.gov.scot/policies/physical-activity-sport/ [Accessed 22 Mar. 2018]. ↑ 44.0 44.1 Wright A, Roberts R, Bowman G, Crettenden A. Barriers and facilitators to physical activity participation for children with physical disability: comparing and contrasting the views of children, young people, and their clinicians. Disability and rehabilitation. 2018 Jan 30:1-9. ↑ 45.0 45.1 Brunton G, Harden A, Rees R, Kavanagh J, Oliver S, Oakley A. Children and physical activity: a systematic review of barriers and facilitators. ↑ 46.0 46.1 Martins J, Marques A, Sarmento H, Carreiro da Costa F. Adolescents’ perspectives on the barriers and facilitators of physical activity: a systematic review of qualitative studies. Health education research. 2015 Aug 31;30(5):742-55. ↑ 47.0 47.1 Estabrooks PA, Lee RE, Gyurcsik NC. Resources for physical activity participation: does availability and accessibility differ by neighborhood socioeconomic status?. Annals of behavioral medicine. 2003 Apr 1;25(2):100-4. ↑ 48.0 48.1 Eyre EL, Duncan MJ, Birch SL, Cox VM. Low socio-economic environmental determinants of children's physical activity in Coventry, UK: A Qualitative study in parents. Preventive medicine reports. 2014 Jan 1;1:32-42. ↑ 50.0 50.1 50.2 50.3 The Children and Young People (Scotland) Act. Edinburgh: The Scottish Government; 2014. ↑ 51.0 51.1 51.2 The Scottish Government. A Guide to Getting It Right for Every Child. Edinburgh: The Scottish Government; 2012. ↑ 53.0 53.1 The Scottish Government. Early Years and Early Intervention: A Joint Scottish Government and COSLA Policy Statement. Edinburgh: The Scottish Government; 2008. ↑ The Scottish Government. Child Protection Guidance for Health Professionals. Edinburgh: The Scottish Government; 2013. ↑ 55.0 55.1 55.2 The Scottish Government. 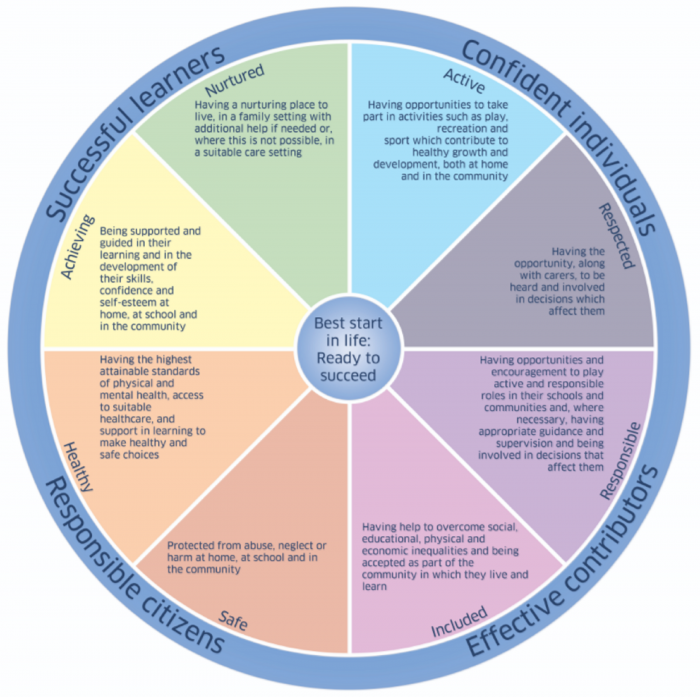 Ready to Act: A transformational plan for Children and young people, their parents, carers and families who require support from allied health professionals (AHPs). Edinburgh: The Scottish Government; 2016. ↑ The Scottish Government. AHPs as agents of change in health and social care The National Delivery Plan for the Allied Health Professions in Scotland, 2012–2015. Edinburgh: The Scottish Government; 2012. ↑ The scottish Government. Allied Health Professions Co-creating Wellbeing with the People of Scotland: The Active and Independent Living Programme in Scotland. Edinburgh: The Scottish Government; 2017. ↑ The Scottish Government. Early Years and Early Intervention: A Joint Scottish Government and COSLA Policy Statement. Edinburgh: The Scottish Government; 2008. ↑ 59.0 59.1 United Nations. Convention on the Rights of the Child. Geneva: United Nations Office of the high commissioner on human rights; 1989. ↑ The Scottish Government. National Guidance for Child Protection. Edinburgh: The Scottish Government; 2014. ↑ The Scottish Health Council. Involving young people in planning and delivery of health and social care: Scoping a pan-Scotland collaborative approach. Glasgow: The Scottish Health Council; 2017. ↑ HM Governement. Working Together to Safeguard Children: A guide to inter-agency working to safeguard and promote the welfare of children. London: HM Government; 2015. ↑ The Children (Scotland) Act. Edinburgh: The Scottish Government; 1995. ↑ The Scottish Government. Protection from Abuse (Scotland) Act. Edinburgh: The Scottish Government; 2001. ↑ The Scottish Government. Protection of Children and Prevention of Sexual Offences (Scotland) Act. Edinburgh: The Scottish Government; 2005. ↑ Protection of Vulnerable Groups (Scotland) Act. Edinburgh: The Scottish Government; 2007. ↑ The Scottish Government. What to do if you’re worried a child is being abused: Advice for practitioners. Edinburgh: The Scottish Government; 2015. ↑ Department of Education. Sexual Exploitation Definition and a Guide for Practitioners, Local Leaders and Decision Makers Working to Protect Children from Child Sexual Exploitation. London: Department of Education; 2017. ↑ HM Government. Safeguarding Children in Whom Illness is Fabricated or Induced. London: HM Government; 2018. ↑ The Royal College of Paediatrics and Child Health. Guidance on clinical research involving infants, children and young people: an update for researchers and research ethics committees. London: The Royal College of Paediatrics and Child Health; 2014. ↑ Age of Legal Capacity (Scotland) Act. Edinburgh: The Scottish Government; 1991. ↑ The Royal College of Nursing. Informed Consent in Health and Social Care Research: RCN guidance for nurses. London: Royal College of Nursing Publishing; 2005. ↑ The Department of Health. Consent – what you have a right to expect: A guide for parents. London: The Department of Health; 2001. ↑ Graham A, Powell M, Taylor N, Anderson D, Fitzgerald R. Ethical research involving children. Florence: UNICEF Office of Research; 2013. ↑ Medical Research Centre. Ethics Guide: Medical research involving children. London: Medical research Centre; 2004. ↑ Shaw C, Brady L, Davy C. Guidelines for Research with Children and Young People. London: National Children’s Bureau Research Centre; 2011. ↑ 82.0 82.1 Spriggs M. Understanding Consent in Research Involving Children: The ethical Issues. A Handbook for Human Research Ethics Committees and Researchers. Parkville: Children's Bioethics Centre; 2010. ↑ Alderson P, Morrow V. The Ethics of Research with Children and Young People: A Practical Handbook. London: Sage; 2011. ↑ 88.0 88.1 Behaviour Change: General Approaches. [Internet]. The National Institute for Health and Care Excellence. 2007 [cited 14 April 2018]. Available from: https://www.nice.org.uk/guidance/ph49. ↑ 89.0 89.1 Swann C, Carmona C, Ryan M, Raynor M, Baris E, Dunsdon S, Kelly MP. Health systems and health-related behaviour change: a review of primary and secondary evidence. National Institute for Health and Clinical Excellence. 2010. ↑ 90.0 90.1 90.2 90.3 90.4 Middleton KR, Anton SD, Perri MG. Long-term adherence to health behavior change. American Journal of Lifestyle Medicine. 2013 Nov;7(6):395-404. ↑ Chartered Society of Physiotherapy. CSP Corporate Strategy 2017-2020. London: Chartered Society of Physiotherapy; 2017. 2 p.
↑ Mouton A, Mugnier B, Demoulin C, Cloes M. Physical Therapists' Knowledge, Attitudes, and Beliefs About Physical Activity: A Prerequisite to Their Role in Physical Activity Promotion? Journal of Physical Therapy Education. 2014 Oct 1;28(3):120-7. ↑ Biddle SJ, Mutrie N. Psychology of Physical Activity: Determinants, Well-being and Interventions. Routledge; 2008 Sep 12. ↑ 94.0 94.1 Haas S, Nigg CR. Construct validation of the stages of change with strenuous, moderate, and mild physical activity and sedentary behaviour among children. Journal of Science and Medicine in Sport. 2009 Sep 1;12(5):586-91. ↑ 95.0 95.1 Armitage CJ. Is there utility in the transtheoretical model? British Journal of Health Psychology. 2009 May 1;14(2):195-210. ↑ 96.0 96.1 96.2 96.3 Woods C, Mutrie N, Scott M. Physical activity intervention: a transtheoretical model-based intervention designed to help sedentary young adults become active. Health education research. 2002 Aug 1;17(4):451-60. ↑ Marcus BH, Forsyth LH. Motivating people to be physically active. Human Kinetics; 2009. ↑ 98.0 98.1 Romain AJ, Horwath C, Bernard P. Prediction of physical activity level using processes of change from the transtheoretical model: experiential, behavioral, or an interaction effect? American Journal of Health Promotion. 2018 Jan;32(1):16-23. ↑ Nigg CR, Courneya KS. Transtheoretical model: Examining adolescent exercise behaviour. Journal of adolescent health. 1998 Mar 1;22(3):214-24. ↑ 100.0 100.1 Prochaska JO, Velicer WF, Rossi JS, Goldstein MG, Marcus BH, Rakowski W, Fiore C, Harlow LL, Redding CA, Rosenbloom D, Rossi SR. Stages of change and decisional balance for 12 problem behaviours. Health psychology. 1994 Jan;13(1):39. ↑ Prochaska JO, Velicer WF, DiClemente CC, Fava J. Measuring processes of change: applications to the cessation of smoking. Journal of consulting and clinical psychology. 1988 Aug;56(4):520. ↑ 102.0 102.1 Prochaska JO, Velicer WF. The transtheoretical model of health behavior change. American journal of health promotion. 1997 Sep;12(1):38-48. ↑ Janis IL, Mann L. Decision making: A psychological analysis of conflict, choice, and commitment. New York, NY, US: Free Press; 1977. ↑ Kroll C, Keller R, Scholz U, Perren S. Evaluating the decisional balance construct of the Transtheoretical Model: are two dimensions of pros and cons really enough? International Journal of Public Health. 2011 Feb 1;56(1):97-105. ↑ Marcus BH, Rakowski W, Rossi JS. Assessing motivational readiness and decision making for exercise. Health Psychology. 1992;11(4):257. ↑ Marcus BH, Owen N. Motivational readiness, self‐efficacy and decision‐making for exercise. Journal of applied social psychology. 1992 Jan 1;22(1):3-16. ↑ Keller CS, McGowan N. Examination of the processes of change, decisional balance, self-efficacy for smoking and the stages of change in Mexican American women. Journal of Nursing Research, 2001. ↑ Bandura A, Walters RH. Social Learning Theory. Englewood Cliffs, NJ: Prentice-hall; 1977 Mar. ↑ 110.0 110.1 110.2 110.3 Hamilton K, Warner LM, Schwarzer R. The role of self-efficacy and friend support on adolescent vigorous physical activity. Health Education & Behaviour. 2017 Feb;44(1):175-81. ↑ Dumith SC, Gigante DP, Domingues MR, Kohl III HW. Physical activity change during adolescence: a systematic review and a pooled analysis. International Journal of Epidemiology. 2011 Jan 18;40(3):685-98. ↑ Sterdt E, Liersch S, Walter U. Correlates of physical activity of children and adolescents: A systematic review of reviews. Health Education Journal. 2014 Jan;73(1):72-89. ↑ Dishman RK, Saunders RP, Motl RW, Dowda M, Pate RR. Self-efficacy moderates the relation between declines in physical activity and perceived social support in high school girls. Journal of Paediatric Psychology. 2008 Sep 23;34(4):441-51. ↑ Warner LM, Ziegelmann JP, Schüz B, Wurm S, Schwarzer R. Synergistic effect of social support and self-efficacy on physical exercise in older adults. Journal of Aging and Physical Activity. 2011 Jul;19(3):249-61. ↑ Gibbons SL, Naylor PJ. 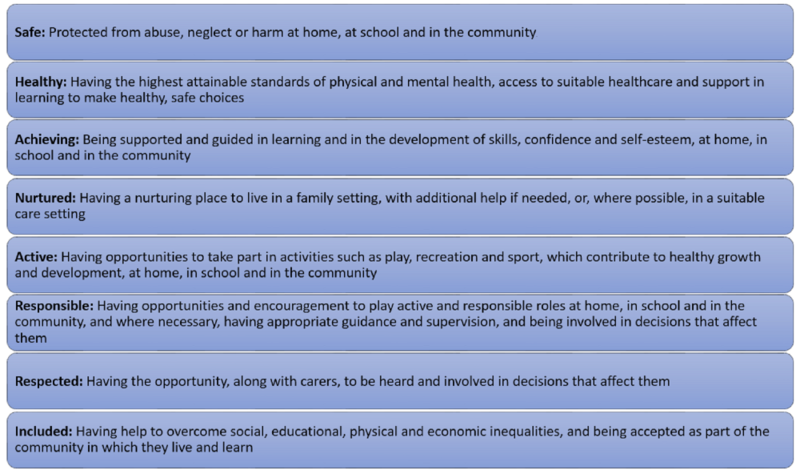 Whole school obesity prevention models: Considerations for secondary schools. Physical & Health Education Journal. 2007 Jan 1;72(4):8. ↑ 116.0 116.1 116.2 Craig CL, Marshall AL, Sjorstrom M, Bauman AE, Booth ML, Ainsworth BE, Pratt M, Ekelund UL, Yngve A, Sallis JF, Oja P. International physical activity questionnaire: 12-country reliability and validity. Medicine and science in sports and exercise. 2003 Aug 1;35(8):1381-95. ↑ Lee PH, Macfarlane DJ, Lam TH, Stewart SM. Validity of the international physical activity questionnaire short form (IPAQ-SF): A systematic review. International Journal of Behavioral Nutrition and Physical Activity. 2011 Dec;8(1):115. ↑ Rääsk T, Mäestu J, Lätt E, Jürimäe J, Jürimäe T, Vainik U, Konstabel K. Comparison of IPAQ-SF and Two Other Physical Activity Questionnaires with Accelerometer in Adolescent Boys. PloS one. 2017 Jan 5;12(1):e0169527. ↑ Guedes DP, Lopes CC, Guedes JE. Reproducibility and validity of the International Physical Activity Questionnaire in adolescents. Revista Brasileira de Medicina do Esporte. 2005 Apr;11(2):151-8. ↑ 121.0 121.1 121.2 121.3 Miller, W.R. and Rollnick, S. Motivational interviewing: Helping people change. 3rd ed. New York: Guilford publications. 2013. ↑ Resnicow K, Davis R, Rollnick S. Motivational interviewing for pediatric obesity: conceptual issues and evidence review. Journal of the American Dietetic Association. 2006 Dec 1;106(12):2024-33. ↑ 123.0 123.1 123.2 Miller W, Rollnick S. Motivational interviewing: Preparing people for change. Journal for Healthcare Quality. 2003 May 1;25(3):46. ↑ DiClemente CC, Velasquez MM. Motivational interviewing and the stages of change. Motivational interviewing: Preparing people for change. 2002;2:201-16. ↑ 125.0 125.1 125.2 125.3 Velasquez MM, Stephens NS, Ingersoll K. Motivational interviewing in groups. Journal of Groups in Addiction & Recovery. 2006 Apr 26;1(1):27-50. ↑ Grays LA, Steele RG. A meta-analysis of motivational interviewing interventions for pediatric health behavior change. Journal of consulting and clinical psychology. 2014 Jun;82(3):521. ↑ Müller-Riemenschneider F, Reinhold T, Nocon M, Willich SN. Long-term effectiveness of interventions promoting physical activity: a systematic review. Preventive Medicine. 2008 Oct 1;47(4):354-68. ↑ Robison J, Rogers MA. Adherence to exercise programmes. Sports Medicine. 1994 Jan 1;17(1):39-52. ↑ Tengland PA. Behavior change or empowerment: On the ethics of health-promotion strategies. Public Health Ethics. 2012 Jul 1;5(2):140-53. ↑ Tengland PA. Empowerment: A conceptual discussion. Health Care Analysis. 2008 Jun 1;16(2):77-96. ↑ 131.0 131.1 NHS Scotland. Everyone matters: 2020 workforce vision. Edinburgh:NHS Scotland; 2011. 8 p.
↑ Hongu N, Kataura MP, Block LM. Behavior change strategies for successful long-term weight loss: Focusing on dietary and physical activity adherence, not weight loss. Journal of Extension. 2011 Feb;49(1):1-4. ↑ DiMatteo MR. Social support and patient adherence to medical treatment: a meta-analysis. Health Psychology. 2004 Mar;23(2):207. ↑ Lindqvist AK. Physiotherapists enabling school children's physical activity using social cognitive theory, empowerment and technology. European Journal of Physiotherapy. 2017 July 3;19(3):147-53. ↑ Spink KS, Carron AV. Group cohesion and adherence in exercise classes. Journal of Sport and Exercise Psychology. 1992 Mar;14(1):78-86. ↑ Direito A, Jiang Y, Whittaker R, Maddison R. Smartphone apps to improve fitness and increase physical activity among young people: protocol of the Apps for IMproving FITness (AIMFIT) randomized controlled trial. BMC public health. 2015 Dec;15(1):635. ↑ Chan A, Kow R, Cheng JK. 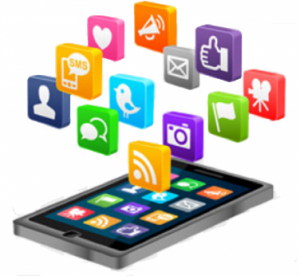 Adolescents' Perceptions on Smartphone Applications (Apps) for Health Management. Journal of Mobile Technology in Medicine. 2017 Aug 9;6(2):47-55. ↑ Dute DJ, Bemelmans WJ, Breda J. Using mobile apps to promote a healthy lifestyle among adolescents and students: a review of the theoretical basis and lessons learned. JMIR mHealth and uHealth. 2016 Apr;4(2).